I have now updated the progress made after NMRlipids III: Preliminary observations post into the manuscript. 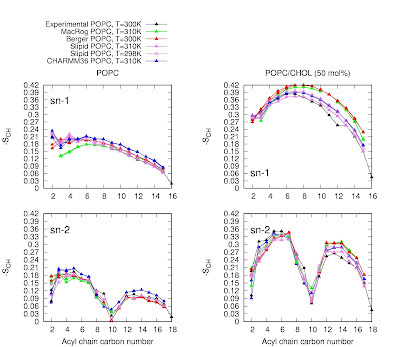 After extensive discussion about correct parameters to run CHARMM36 simulations it was concluded that the results from Gromacs 5 are consistent with other simulation packages and literature. Thus, the results from CHARMM gui parameters simulated with Gromacs 5 are currently used in the manuscript. However, there might still be some issues with parameters given by CHARMM gui for systems with cholesterol. 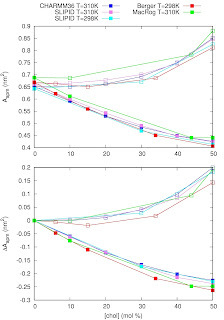 Current comparison for acyl chain order parameters between different simulation models and experiments is shown in Fig. 1. The main conclusion is that cholesterol ordering effect is overestimated in Berger/Holtje and MacRog models, while slight overestimation is observed also in CHARMM36 and Slipid models. The significance of overestimation in CHARMM36 and Slipid is yet to be analyzed (see Things to do list below). FIG. 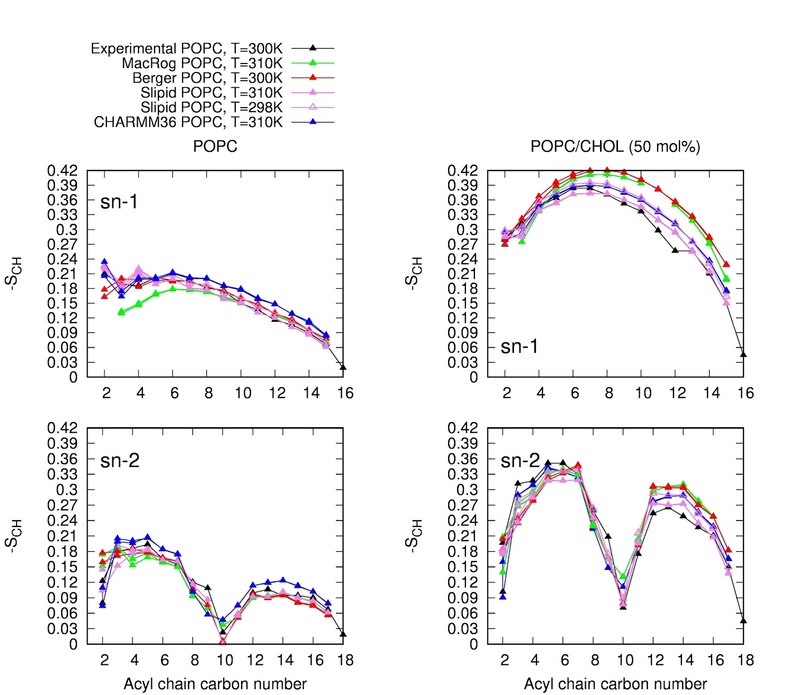 1: Order parameters from simulations and experiments for acyl chains of 1-palmitoyl-2-oleoylphosphatidylcholine (POPC) with and without cholesterol. Final comparison between form factors from simulations and experiments is yet to be done, but area per PC headgroups and per total number of molecules from different simulations are shown in Fig. 2. The difference between models do not seem excessively large, but Berger/Holtje and MacRog models predict strongest effect due to cholesterol in line with order parameter results. FIG. 2: Area per molecules calculated from different simulation models as a function of cholesterol concentration. Solid marks are area per total amount of molecules (chol+PC) and empty marks are area per PC headgroups. Top figure shows absolute values and bottom figure shows changes respect to pure lipid system. 1) Is the quantitative accuracy of experimental order parameters same for acyl chains as for glycerol backbone and headgroup (0.02) discussed in NMRlipids I ? 2) Can the overestimation of order parameters in simulations be explained by missing undulations, as sometimes suggested? [update 19.9.2018] As discussed in the GitHub issue linked here, the undulations does not seem to make significant difference. Lipid 14 results from model by Madej et al. should be somehow included. Comparison of form factors between simulations and experiments should be finished. I have quite a few simulations running that can hopefully be added fairly soon to this work. They are of several GROMOS force fields (43A1-S3, 54A7/53A6L and CKP) with differing amounts of POPC/Cholesterol (from 0 to 50 %). I will upload the simulations once they are completed and report back. As for your list of things to be done, I will be submitting some work relating to point 1 (the agreement of the acyl chains with experiment for POPC), amongst other things related to the calculation of acyl chain order parameters, very shortly. Unfortunately I cannot comment much further regarding the results yet as this study has been partly performed using funding from my current employer (the UK government's MOD) and so there are procedures I am required to follow regarding the release of this work into the public domain. That said, the gist of some of this work can be seen in the recent correction to my older PC comparative force field study (http://pubs.acs.org/doi/abs/10.1021/acs.jctc.7b00244). As soon as I can I will happily discuss this work, and sorry again for not being able to share the work now (as I would very much like to do), especially given the philosophy of this project. I should probably also say that the simulations mentioned above (POPC/Cholesterol), and any others I have so far discussed on this blog/github (CHARMM36 DPPC/POPC, PS simulations), have not been funded through work and so this problem does not arise for any of these. I am wondering if there is a conceptual problem with the comparison to the form factors. Namely, if I understand this correctly, the experimental form factors (FF) result from interpreting the scattering intensities through a model — in the present case the SDP-GAP model described in Heftberger et al. Against these FFs we then are comparing the FFs calculated from MD. So in a way it seems like we are comparing a simulation against a model. Would it be possible to compare MD directly to scattering intensities? Or could we obtain the FFs from scattering intensities by using the MD (instead of SDP-GAP) as a model? And then compare these FFs to the FFs calculated directly from the MD? I guess these two should match if MD is correct. As discussed in section 4.1. in NMRlipids V publication, the conclusion was that form factor is not, in principle, directly measurable. However, it seems to be robust respect to the model used for the structure factor. In principle you could measure scattering form factors more or less directly by using unilamellar vesicles but this is way more tricky than using multilamellar ones. I think too that the model for structure factors is quite robust as described there and as it was already proven by other Groups. I quite like Markus idea to compare MD directly to scattering intensities. Years ago I met a guy at a conference, who was using MD data as a model for scattering data and he was trying to optimize Simulation data against experimental data, although this was not about lipids, but about proteins. But I am not sure about the structure factor in the scattering intensities, because of the multilamellarity. Would you need a model again for the structure factor? I would guess yes? But in general I think it would be great to directly compare simulation and experimental data in order to avoid additional uncertainties due to the model approach.